Nissan today announced that its GT-R supercar achieved a lap time at the infamous Nurburgring in Germany of seven minutes and 29 seconds. Recorded on April 16 and 17, the GT-R used was a base specification car and fitted with the standard Japanese market tires. Driven by GT-R chief test driver Tochio Suzuki, this latest lap time beats the previous fastest time for the GT-R by nine seconds. The previous best lap time for GT-R of 7:38, also driven by Suzuki, was one of the fastest laps achieved by a production car despite conditions being slightly damp on two corners. 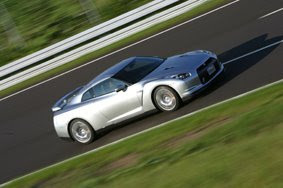 Deliveries of the all-new GT-R began in Japan in December 2007. Sales in the US and Canada start in July and extend to Europe and other markets over the next 12 months."
. Standard car, on standard tires. I think they were very careful how they said it this time. Probably on the Dunlops this time. ZR what ? Z0 what? I guess some of those rumored 7:18 numbers for the Vspec might be correct.